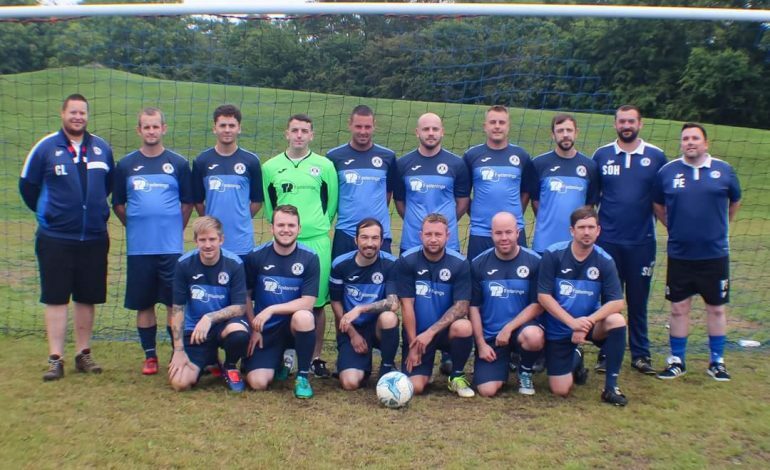 Newton Aycliffe Sports Club FC’s season started a little later than most with their first home game on August 16 against local rivals Hallington FC. The home side took the lead on 10 minutes when a long cross from new signing Sean Johnson found last seasons leading scorer Kyle Allen who nodded home past Chris Wilson in the Hallington goal. Sports Club continued the half the stronger, but could not extend the lead before the break. After the break, Hallington came out the sharper of the two teams and put the sports club on the back foot. One of the strangest incidents we’ve seen for a while led to the equalising goal. As the ball was pumped forward by Hallington into the oppositions half, a spectating dog managed to get onto the pitch, headed the ball back to Hallington, and with goalkeeper Craig Hannant, caught off his line, Hallingtons long range effort found the back of the net… and although everyone believed it should have been a drop ball or free kick, the referee allowed the goal to stand. That changed the outcome of the game and with only eight minutes left Hallington netted the winner to take all three points. Games come thick and fast at the start of the season and this game was quickly followed by an away game to BH Blues in Bishop Auckland on Sunday August 19. The Sports Club started this game slowly and were two goals down after 18 minutes. However, not ones to let the heads go down, they quickly applied pressure and got themselves back into the game. A throw-in found Anthony Campbell who drilled a shot goalwards and a deflection off centre forward Kieran Jordan made it 2-1 on 25 minutes. Less than five minutes later, centre half Sean Johnson went on a mazy run that eventually end up at the feet of Jimmy Cameron who slotted home the equaliser. On 35 minutes, Sports Club took the lead, a long ball found Jimmy Cameron who held the ball up well before playing Kieran Jordan in for his second before half-time. BH Blues came out fighting second half looking for an equaliser but on 70 minutes a short corner was played to Kieran Jordan who turned provider again to find Jimmy Cameron to slot home to make it 4-2. Injuries to Gareth Boyes and David Teder forced two substitutions on 75 minutes and the Aycliffe side lost the shape and fluency that they had earlier. And it took only a few minutes for the home team to grab a third goal when confusion in the penalty area lead to the ball not being cleared and the resulting goal allowed the home team back into the game. A free-kick with less than 10 minutes to go saw the home team grab the equaliser when the ball bounced back off the cross bar and with the defence slow to react BH Blues grabbed the important goal. Sports Club now have two home games – on Thursday 24 and Sunday 27 at Moore Lane – to try and get more points on the board at this early stage of the season. Newton Aycliffe would like to thank TR Fastenings, sponsors of this season’s home kit, and the Big Boys Charity Section at Newton Aycliffe Sports Club for their contribution which will see the team in new tracksuits for the 2018-19 season.